We don’t have a ton of kids at my church. Two who are regular. A few more (several babies!!) who come every couple of weeks. But one regular 5-year-old Sunday School participant, who, weekly, gets a lesson, a lot of stories and always arts and crafts (which, when I’m teaching, usually means Play-dough and Crayons). Me: But then someone came to see them. Who was it? Me: And what did Jesus do? 5-Year-old: [here you have to imagine the 5-Year-old and me both blowing with very exaggerated, very full, very puffy cheeks]. Me: And what did Jesus say to them? 5-Year-old: Peace be with you! Me: And then were they still scared? So we went into the church where the altar guild, the deacons, and the flower guild were all working and told the story to each of them. Then we found the treasurer and the Senior warden and told them. And then to the 5-Year-old’s mom. And now I’m telling you. It was great fun. So if you’re feeling scared and aren’t sure what to do, just imagine Jesus, with big, puffy cheeks, blowing on you and saying Peace! 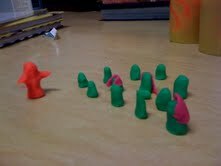 Here are some pictures of my play-dough renditions of the scene. Jesus is orange, in case you’re wondering. I feel humbled. And sad. And wishing that I was a lottery winner or the inventor of something brilliant and money worthy. I have a parishioner, who I’ll call Clark. Clark is an older man, with a couple of illnesses. He moves from tenement to tenement, looking for places that are safe, drug free and affordable–an unlikely trinity in this city. He’s currently homeless (for another 2 hours and 10 minutes). He came up for communion tonight and unlike his usual response after I commune him of “God Bless you, Sarah,” tonight Clark stumbled. He took the bread from me. And the wine from the deacon. And then the deacon gave the wine back to me for me to finish. He walked back and said to me: “I didn’t get a good sip,” so I gave him the chalice again. And he sipped a small sip. And then he stumbled. “Are you okay?” I asked. “Yes, I’m okay. Good night, Sarah,” he said. I walked out of the church, down the side aisle and found him lying on the back pew. A few minutes later our deacon/nurse and I sat with him and began to sort out his life. He can’t cash a check until midnight, so for 4 hours, he will ride the El until then to keep warm. Then he will rent a room at a less than lovely hotel, but he’ll be off the streets tonight. Tomorrow he will get back on the meds he’s been off for a month because he hasn’t been able to afford the monthly CTA pass to get to the center where he gets his meds. I bought him dinner, so he has a full belly. I can’t do much for many with my limited means. But Clark is a long time member, who knows the liturgy better than most anybody. And a dear man. And as I sit at home, in my comfy PJs, having eaten some leftover steak, I find myself thinking about him. It’s cold. And Christ is Risen. Here’s the rub, we are an Easter people. Redemption has come and yet the work–the work remains. Children who grow up in the Episcopal Church today probably don’t remember their first communion. Our theology today is one that includes children at this family meal from the time of their baptism, which is frequently done when they are infants. And I love that children never remember a time when they weren’t welcome, when communion was not part of what church and God and community mean. That said, I grew up at a time when first Communion was a big deal, and not done on the day of baptism, but when you were a bit older. There were classes of preparation, days, weeks, months of anticipation all for this tiny crumb of bread and sip of wine. I remember my own first communion and the excitement that went on around it. My mother took me shopping for a dress, I imagine, but most certainly for an Easter bonnet. She bought silk flowers for it and we wove them in and out of the holes in the straw hat in the week before Easter Sunday, the day that would mark my first communion. That Easter morning, my father went, as was his custom, to the early church service to read. My mother and I ate a lazy breakfast and were getting dressed. I remember the distress in his voice as he entered the house, calling my mother’s name. Calling her name, over and over, until we both came running. “The church,” he said. “the church is on fire.” Easter morning and the church was burning. 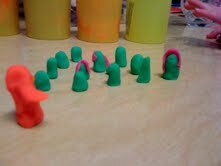 (To be precise, it was the Christian Formation building, but still, the Church). We arrived at the church, like so many others, a silent vigil, watching in horror as hoses full of water broke through windows, as orange and red flames spit out of that beloved space. 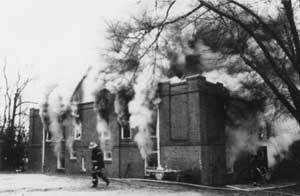 As the fire began to die down, word came that we would have our Easter Day mass at the Baptist Church around the corner at one o’clock. I imagine how strange all of it must have been for my parents. Not just not having Easter in the Church, not just the horror of watching helplessly as that sacred space burned, but the strangeness of watching their daughter take her first communion not in the familiar marble altar rail, but in a rather generic worship space, without the smells of incense and the colours of the stained glass windows, without the comfort of what was, at that time, home. And yet, even in the different space, it worked. It was Easter. The community of the faithful was gathered and fed. Hymns were sung and Alleluias proclaimed. And we returned to our home, gratefully, the next week. As for me, of that day, I remember very little. Except for kneeling at a rail, filled with expectation, curious and excited all at once. My eyes fixed on Father Ferguson, and I stretched forth my hands to receive that funny piece of bread. And it was good. Alleluia, Christ is Risen! Happy Easter. A long time favorite, set to the tune of “O Sacred Head Sore Wounded” is Paul Simon’s “American Tune.” Beautiful and haunting. Totally Good Friday. Had I more time and energy, I’d add more, but that’s it for now. Time to make dinner and then to bed. What’s on your Triduum play list?